John Zorn is perhaps best known for his avant-garde group Naked City, which played a jarring fusion of free jazz, punk rock, and movie themes. But this is only one of John’s many diverse creative outlets. The multiplicity of his body of work really exposes the futility of lumping music into “genres”. John writes what I would prefer to call “chamber music”, a label that encompasses a wide variety of instrumentations and settings. Today’s tune comes from John’s group Masada, specifically the Live in Jerusalem album. The quartet (Zorn, Dave Douglas, Greg Cohen and Joey Baron) sort of reminds me of Ornette Coleman’s quartet work; the melodies are often frenetic and the soloists have freedom to overlap and complement or contradict each other. The difference is that with Masada, there is much more structure. The themes predominantly feature the harmonic minor scale and the bass mostly sticks to a simple ostinato rather than reacting to the others’ input. This is basically a 6-bar blues with digressions. This entry was posted in Uncategorized and tagged jazz, John Zorn, lead sheet, music, Noteheads, Ravayah, transcription on February 29, 2016 by noteheads. Here’s another cool tune from saxophonist Dayna Stephens. This entry was posted in Uncategorized and tagged Common Occurances, Dayna Stephens, jazz, lead sheet, music, Noteheads, transcription on February 16, 2016 by noteheads. I finally got around to transcribing a Lyle Mays tune I’ve been meaning to work on for a while. It comes from Pat Metheny’s 1995 album We Live Here, which showcases some great compositions and guitar playing. It rewards repeated listening, though I find the production on the album to be heavy-handed; the tracks are drenched in reverb and soulless drum machine loops, putting most of them squarely in a genre some would call “weather channel jazz”. Still, both Metheny and Mays are experienced writers who know how to spin a thread of melody into a colorful tapestry, and this song is no exception. 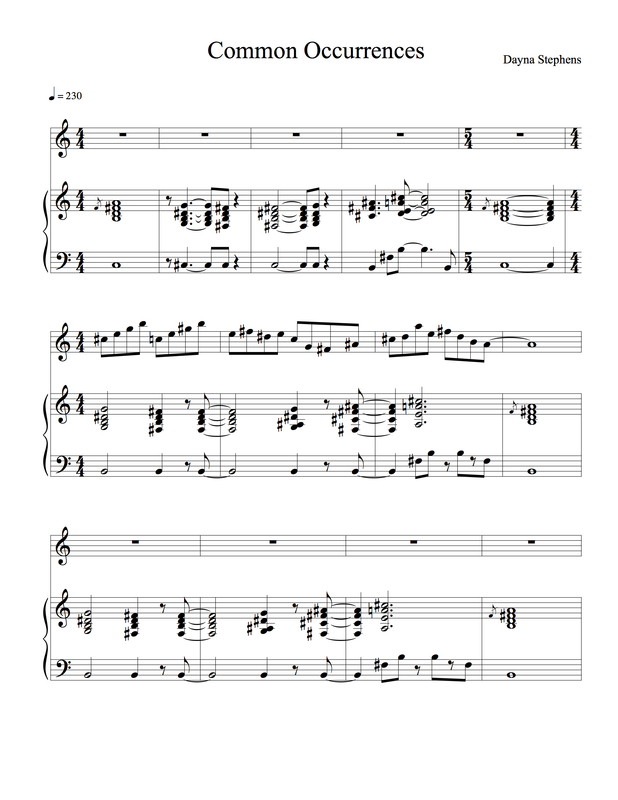 It has quite a long head with a lot of rhythmic variation, but you can see the main theme is built on a simple diminished scale idea (especially made plain after the coda). There isn’t much functional harmony either, as the chord progression is mostly minor 9th chords moving in seconds and thirds to create tension and release. This makes it easier to disguise the subtle changes in form and key during the solo section. The other tunes on the record were co-written by Pat Metheny and so can be found in the Pat Metheny Song Book, an invaluable resource for those who want to learn more about his compositional style. This entry was posted in Uncategorized and tagged Episode d'Azur, jazz, lead sheet, Lyle Mays, music, Noteheads, transcription on February 4, 2016 by noteheads.